What is a Thangka ? Dating back to the 7th century A.D, thangka painting is unequivocally one of the greatest art forms of Asia, and is considered to be part of the Abhidharma or “Art of Enlightenment”. This means that thangkas are considered Buddhist iconography and abide by strict rules. Thangka has since become an traditional artform which we which we have collected for a number of years. 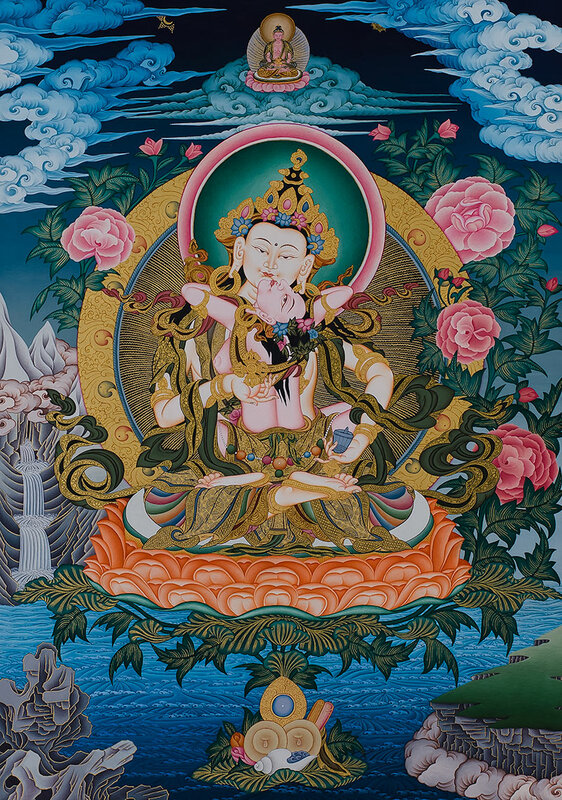 The materials used to create a Thangka have slowly evolved with time, the methods/techniques have, however, remained almost entirely intact, passed down from one generation to the next. A great amount of study is also required to paint a Thangka, each ornament, posture and attribute represents a particular aspect of Buddhism and its teachings. The very first step in is to prepare the canvas, once that has been done, the artist will begin to sketch the motif that he has decided to paint, he will then apply the colour, lines and gold. Read about this in more detail in the “Techniques and Artists” section of the site. The final and most important step in how to paint a Thangka is the painting of the facial features. This is often left to the 'Guru' or 'Master' as it is considered the most sacred part of the Thangka. The Buddhist pantheon is rich in myth and legend, and there are innumerable emanations of the Buddha. Each deity in the pantheon has a peaceful form with calm soothing features, a wrathful or “irritated” form with a powerful threatening appearance and a form associated to a specific practice, called a Yidam. There exist another style of Thangka denser and with a lot of miniature work, these often depict a text or historical event that is of great importance. The two most popular examples are the “Life of Buddha” and the “Wheel of Life”.